Donor-advised funds (DAFs) have surged in popularity over the past decade, becoming one of the most talked about and popular giving vehicles. But before development professionals can craft a strategy to engage DAF holders, they need a foundational understanding of the giving vehicle itself. Read on for the information you need to know about the DAF giving process, DAF sponsors, and more. Donor-advised funds may seem like a newer trend, but they have a long history: The New York Community Trust established the first donor-advised fund in 1931. Since then, DAFs have come to offer a mutually beneficial relationship for donors and nonprofits. The percentage of US contributions into DAFs nearly doubled between 2010 and 2016. In 2010, 7.77 billion was contributed into DAFs, representing 4.4 percent of total individual giving. In 2016, $23.27 billion was contributed into DAFs, representing 8.3 percent of total individual giving. It's estimated that at the end of 2016, DAFs held over $85 billion in charitable assets. Contributions to DAF accounts grew by 7.6 percent between 2015 and 2016, while overall charitable giving in the United States grew by 2.7 percent. Beyond their share of overall giving, the grants coming from DAF accounts are often substantial. The average grant from Fidelity Charitable—the largest DAF sponsor in the US—was over $4,000 in 2017, and the median account balance was $15,961 in 2017. After opening a DAF, the individual or group who opened the account can deposit cash, securities, or other assets into the fund where the assets can grow over time. Upon deposit, the donor receives the maximum tax deduction allowed by the IRS for that contribution and loses all legal rights to it. The sponsoring organization obtains legal control over the funds and offers advice on grant-making. 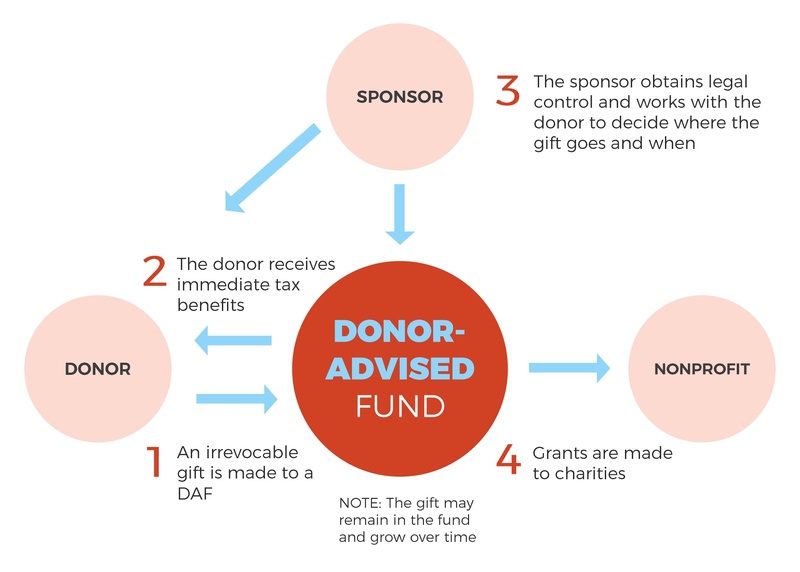 The donor indicates grants they would like to make from the fund, including when and how the grant should be made, and the sponsoring organization makes the grant from the donor’s fund. This process gives donors the benefit of an immediate and maximized tax deduction. At the same time, donors are able to give assets to nonprofits when it’s most beneficial for the organization to receive that gift (like during #GivingTuesday or a campaign). While some sponsoring organizations have regulations for how often a donor must make grants from their DAF, there are no laws requiring payouts. However, data gathered in recent years reports that pay-out rates are typically higher than for foundations. Community foundations, like the Chicago Community Trust and Seattle Foundation, were the first organizations to sponsor DAFs. Community foundations provide the benefit of a strong understanding of local philanthropy and often offer additional services such as family philanthropic consulting. Single-issue charities are fund providers that work in a specific subsector, such as religion or higher education. They encourage giving to a specific cause or organization and often require a certain percentage of pay-out to be directed to a particular issue or institution. Higher education institutions and Jewish federations are examples of single-issue organizations that sponsor DAFs. 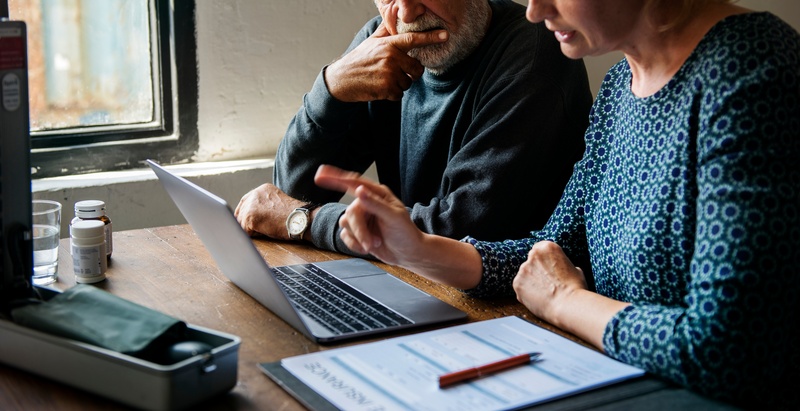 Commercial fund providers, also called national charities, can be independent providers of donor-advised funds or can be connected to national financial institutions. They are the newest type of DAF sponsors, but they sponsor 40 percent of all donor-advised fund accounts. Examples of commercial funders are Fidelity Charitable, Schwab Charitable, and the National Philanthropic Trust. DAFs are particularly useful to donors interested in giving illiquid gifts, such as artwork or land. Many of these providers can liquidate the asset on the donor’s behalf, so the funds can be used to support charitable causes. Donor-advised funds present a significant opportunity for your organization, but engaging with these donors requires a customized approach. In the coming weeks, we’ll share recommendations for engaging donors who have DAFs, connecting with advisors who work with DAFs, and communicating with relevant audiences. Check back soon! Maddy Fisher is a Marketing and Business Development Intern at Campbell & Company. Maddy works to improve our client experience, create thought leadership content, and streamline our firm processes.